Motril, town in Granada, celebrates bullfights coinciding with its Patroness Festivities in honor of the 'Virgen de la Cabeza', around August 15. It is usually a bullfight. It also celebrates a charity festival throughout the bullfighting season. Motril lives its big days coinciding with the feast of August 15. In the park of 'los Pueblos de América' the floral offering is celebrated to the Virgen de la Cabeza, where thousands of townsfolk participate, and the big day the Virgin is taken out in procession through all the streets. You can enjoy the Day Fair in the central 'Plaza de la Coronación', with music and typical dishes such as migas or espichá, always watered by refreshing 'rebujito' (typical drink made with a kind of white wine and sprite). And at night the party moves to the Cortijo del Conde Fair to enjoy the booths, concerts, attractions and raffles; with environments for all tastes. Bullring of Motril 'Pepe el Berenjeno': Camino de la Ventilla 157, 18600-Motril. Motril is to 64,4 km from Granada (55 minutes' drive from Granada). How to get here | Driving Direction. 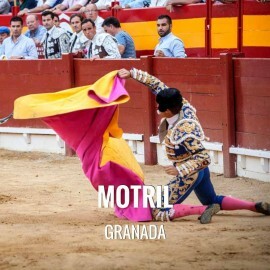 Servitoro, Official Box office of bullfighting tickets sales at Motril, Granada bullring.